Origins Plantscription SPF25 Anti-Aging Cream - Although anti-aging isn't really a skin concern for me at the moment, I still enjoyed using this moisturiser. It sunk in easily despite the high SPF, felt nice on the skin and was moisturising but still felt light. If I wanted an anti-aging cream then I would think about buying this one for a daily moisturiser. Cartier Goutte De Rose Perfume - I couldn't finish this sample as I really didn't like the scent. As the name suggests, it's a very floral scent which I'm not a fan of. I do like floral perfumes but they have to be mixed with other notes. Yin Yang Rich Skin Food - I wasn't that impressed with this face moisturiser. From the name I thought it could be similar to the Weleda Skin Food but it's no where near as moisturising. I wouldn't buy the full size. 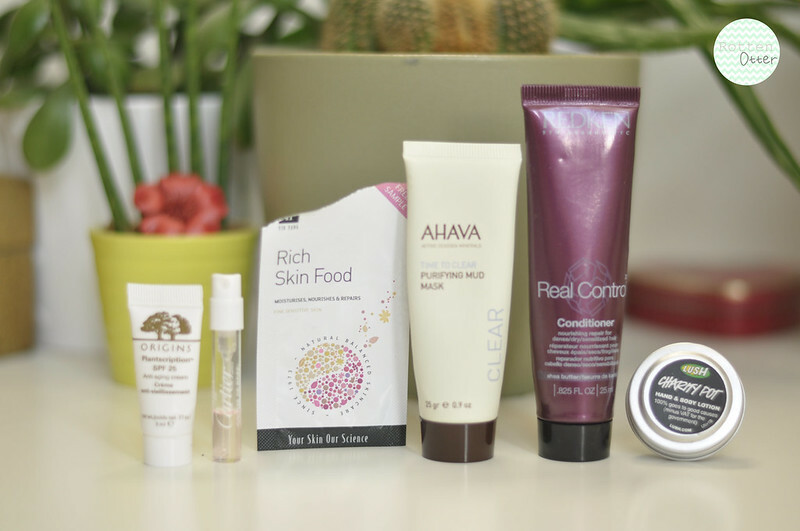 Ahava Purifying Mud Mask - I really enjoyed using this mud mask and as I only use it on my t-zone this small tube lasted a really long time. I used it once a fortnight, usually on a Sunday evening, and it helps to get rid of black heads and clears the skin. I'm currently using a small tube of the Liz Earle version but once I finish that I'll probably buy the full size of this. Redken Real Control Conditioner - I really enjoyed using this conditioner and I will definitely be buying a full size bottle at some point. Designed for dry hair this is perfect for my hair and although I usually prefer deep conditioners, this was incredibly nourishing despite having a thinner texture. Lush Charity Pot Hand & Body Lotion - I always like to get these mini pots from Lush as the £1 you spend goes to charity plus it gives you the chance to try it out before buying the full size. I used this as a hand cream and it was really nice. It smells of chocolate and almost good enough to eat.